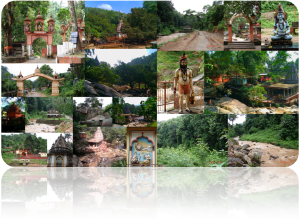 Shiv Temple of Basistha Ashram is located on the southeast of Guwahati, 5km from NH 37 Basistha crossing. It has picturesque beuty of Garbhanga forest on the south, and rice fields on the east. There is a river stream flowing south of temple, suppose to have three tributeris Sandhya, Lalitha and Kanta, but I could find only one. Temple was created by Ahom King Rajeswar Singh in 1764 AD. There is regular city buses and auto services to reach the temple. Slowly lonely surrounding is musrooming with hotels, and shops.